Insomniac Games takes the series back to a "classic feel" while adding online play. Ratchet and Clank have been a staple of Sony's gaming library for a decade, and in celebration of the milestone, Insomniac Games has plans to re-release the heroes' first three adventures as part of the Ratchet & Clank Collection. But that's old news, and you already knew that. 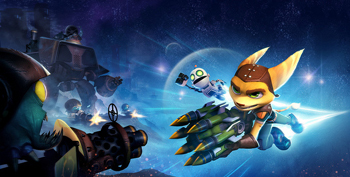 The new news is that the collection will now include Insomniac will be releasing Ratchet & Clank: Full Frontal Assault, an all-new adventure for the duo. Insomniac's President and CEO Ted Price shared only a few details when revealing the title, promising fans that it would return "to the series' classic feel, camera, controls and weapons, while innovating and giving you a whole new way to play." Full Frontal Assault will also feature online play, though no details on the mode were provided. Full Frontal Assault will be available for download via PSN, though no price has been announced. The European version of Full Frontal Assault, titled Ratchet & Clank: QForce!, will be available via PSN or as a disc-based release this autumn, when the game launches in both territories.